Jersey Shore’s Snooki appeared on Ellen today (1/5/11) and Ellen devoted a lot of time to the pint sized reality TV star who was on the show to promote the release of her new book titled Snooki. Snooki’s hair was bone straight, very sleek and worn down near her waist. Her famous hair pouf was nowhere in sight. 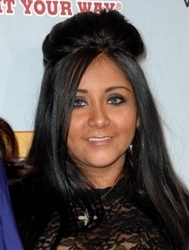 Snooki actually looked gorgeous with her healthy, shiny chocolate brown strands worn straight and down around her waist. Ellen said “you just that (pointing to the hair pouf section) and you know that’s you.” Ellen told Snooki that her pouf was so famous that “for Halloween” I was “your pouf” on the show. While Ellen and Snookie were chatting a man dressed in a big faux hair ball like the one Ellen wore for Halloween snuck up on Snooki and scared her. She screamed and jumped. Then she laid back and said “oh my god.” Ellen said “that was the best scream” and then replayed it. This entry was posted on Wednesday, January 5th, 2011 at 6:49 pm	and is filed under Beauty Beat, Body Beat, Brunette Hair Color, Celebrity Bites, Celebrity Gossip, Celebrity Hairstyles, Celebrity News, Celebrity News & Juice, Ellen Degeneres, Hair, Hairstyles, Long Hair, News, Ramblings On Current News & Events, Reality TV, TV's Picks & Pans. You can follow any responses to this entry through the RSS 2.0 feed. Both comments and pings are currently closed.